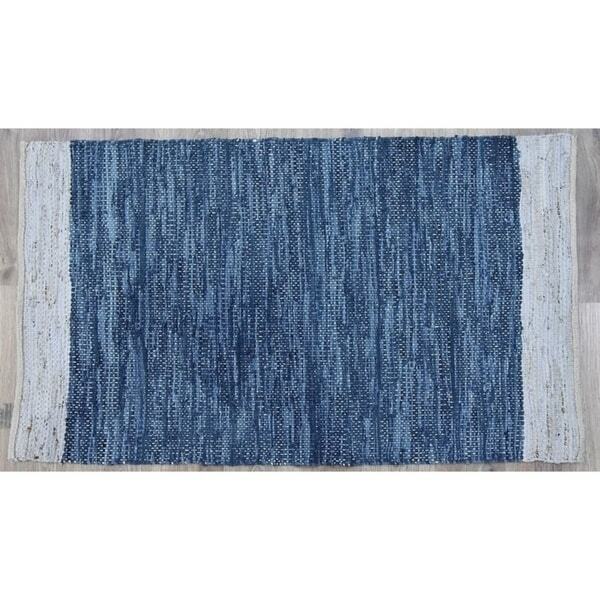 This lovely reversible handwoven leather and jute fiber rug adds contemporary elegance to your home space. Handwoven fiber lengths are stitched into the rectangular rug shape. Hand-spun jute fibers are naturally silky, highly durable and are a fully renewable resource. Features: Natural leather and jute fiber 80% Leather, 10% Jute, 10% Cotton Pile height is 0.25-0.5 inch Hand-woven Does not contain latex Blue and cream colors Tip: We recommend the use of a non-skid pad to keep the rug in place on smooth surfaces. Dimensions 120.0 In. X 96.0 In. X 0.25 In. to keep the rug in place on smooth surfaces.